We understand the stresses that come with the birth of a baby who needs special care. We recognize that you and your family are your baby’s main source of strength and support. Our philosophy of family-centered care nurtures those strong bonds between infants and their families that begin before birth. Our goal is to partner with you to achieve the best possible outcomes for your baby. Our NICU team includes highly specialized physicians and nurses who are trained to take care of these tiny newborns – and their parents, too! We offer many services to the parents of babies in the NICU. We have certified lactation specialists to help you with breastfeeding and many other specialists that can answer any questions about your baby’s care. If your baby is going to be a patient in the NICU for a while, we will provide you with hands-on education that will help you care for your baby. Our intensive care unit staff routinely cares for babies born from 27 to 44 weeks gestation (26 weeks on a case-by-case basis) as well as those with respiratory problems, infections, low blood sugar and jaundice. To provide this high level of care, the NICU has state-of-the-art equipment to help your baby. What is the capacity of the PVH NICU? 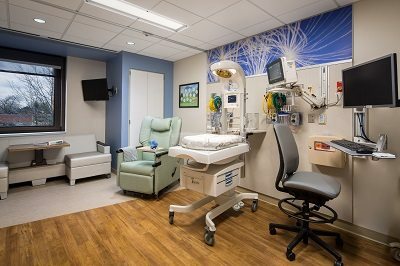 In 2016, we nearly doubled the capacity of the PVH NICU, expanding from 19 to 32 beds, mostly in private rooms. We’re able to provide families with a private lounge and showers, and every room has a convertible sofa, so parents can stay overnight. Our expansion has made accommodating our patients and their families easier and provides an environment that better promotes healing while making their stay more comfortable. In addition to an expanded capacity, our facility is fully equipped with the latest technology and capabilities, such as high-frequency ventilation, nitric oxide and hypothermia therapy. Who designed the new NICU? Getting it right from the patient and family perspective was a key goal when we designed the NICU. To make sure that happened, our design team included a representative from every group of people who take care of babies in the NICU, as well as multiple families of former NICU patients. The latest research shows that babies grow better and have fewer complications during their stay when they are in a quiet environment with less stimulation. Also, private rooms give parents the opportunity to stay with their babies as much as possible and ensure their privacy. As the most important part of our care team, parents are now able to truly participate in their baby’s care as much as possible. What other family support spaces will the unit have? Every patient room is equipped with a special chair for “kangarooing” (holding a baby skin to skin) and a sleep sofa for parents who wish to stay overnight in their baby’s room. Parents have their own space, including outlets to recharge their laptops and smartphones. We have a parent lounge where families can grab a snack and relax. They may also eat meals there and socialize with other families. The unit has shower facilities for parents as well. What other improvements have been made? We upgraded technology to allow babies to be more closely monitored by staff from outside the room, which improves safety and allows the family more privacy and quiet time with their baby. Also, the improved lighting and ventilation contribute to a more healing environment. Some improvements are less noticeable, like the use of building materials that reduce noise in patient rooms. The PVH NICU Parent and Family Advisory Council (PFAC) was created in 2015 to improve collaboration and the overall parent and family experience in the Poudre Valley Hospital Neonatal Intensive Care Unit. The council is comprised of parent volunteers who have had children in the PVH NICU. By sharing their insights and experiences, the parent volunteers work together with the NICU staff to develop and implement programs for current and former NICU families. To advise the NICU staff on patient needs from a family’s perspective and to support a family-centered environment. Development of a milestone bead program. Glass beads are distributed to commemorate unique and important milestones (first hold, first bath, hearing test, etc.) throughout a baby’s NICU stay. Creation of parent and family education and support materials including activity and coloring books for siblings. Distribution of “Welcome bags” filled with comfort care items (facial tissue, lotion, insulated milk storage bag, personalized card, etc.). Establishment of a PVH Foundation NICU PFAC-specific fund. This fund supports the programs and initiatives created by the PFAC. Participate in annual UCHealth NICU and Special Care Nursery reunion. We are always looking for former NICU parents or family members to serve on the PFAC. Please email pvh.nicu.pfac@uchealth.org for more information. Don’t have the time to become a PFAC member but still want to help support this important work? Consider a tax-deductible contribution to the PVH Foundation NICU PFAC fund! To donate, go to the PVH and MCR Foundation page.